Hello and welcome to day 1 of the My Favorite Things February Release Countdown. For the next five days, we'll be sharing cards and projects featuring all of the new products coming out on February 5th at 10am EST. For my card today I used the new Party Penguins stamp set along with the, new Birth-Yay stamp set to create a colorful birthday card. I stamped the stacked of animals onto a white card stock panel with Extreme Black ink, and then I coloured it in with Copic markers. Once I had it coloured, I die cut a piece of masking paper with the coordinating die and put it on the stamped image to protect it so I could add some blue ink to the background. I love doing masking with the coordinating die because it leaves a white border around the image before the inking starts. I stamped a sentiment from the new Party Penguins stamp set onto black card stock, and heat embossed it with white embossing powder, and then I adhered it to the card in separate strips. 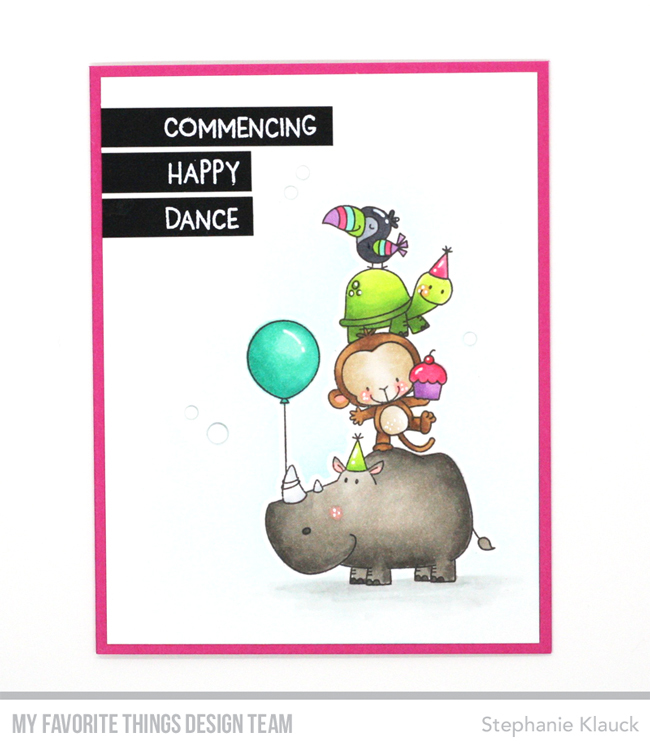 I finished the card with some clear gems and some white pen detail on the stamped images. Thanks so much for joining me for Day 1 of the February release countdown. 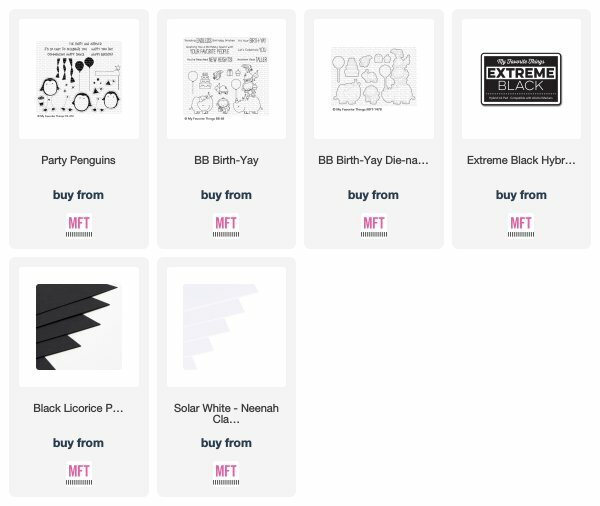 Make sure to head over to the MFT blog for a closer look at the new products and more ideas using them. See you tomorrow for the release! Great job on your coloring! Love this sweet card. 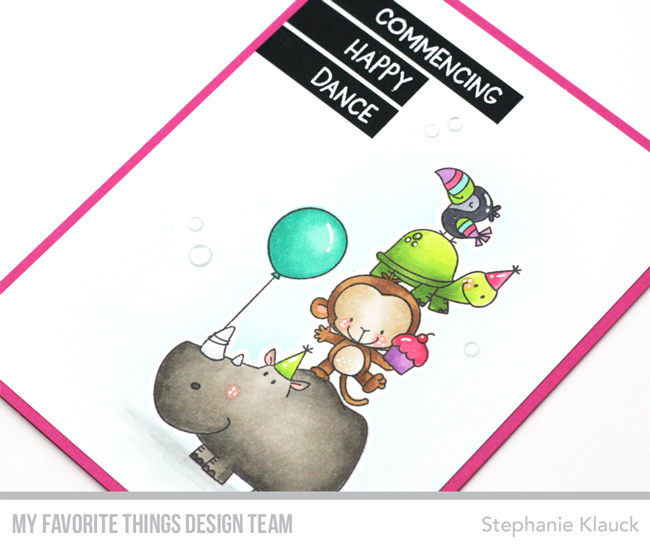 Sweet card and wonderful design and coloring. Oh this card is so cute! I love the colors and this stamp set!! Gorgeous card! Love your coloring. I never thought about die cutting a mask. What a time saver that would be! All content on this blog is © Stephanie Klauck. Please do not post elsewhere without permission.. Powered by Blogger.